This is currently C's favorite book. I picked it up on a whim because we have some board books by Rosemary Wells, and we like the illustrations. 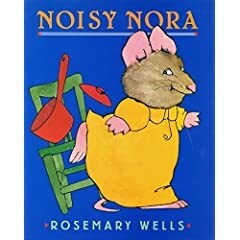 The story of Noisy Nora is told in sing-songy verse and C. is enamored of the whole thing. "Why are you so dumb?" Now, my children are far from saints and they have and occasionally still do call each other things worse even than "dumb." But I don't want to be encouraging it, and I was cringing every time I read the story, wondering how I could lose the book without causing C. any grief. I still don't love it, but at least "bad" is an evaluation of Nora's behavior (which does involve slamming doors, knocking over lamps and chairs, and taking her siblings' belongings) rather than gratuitous name-calling. So I can live with it. Although I still absolutely refuse to read it more than three times at a single sitting. I hate when books have lines like this. You read a book more than once per sitting. You are such a good mom. Please come add your Noisy Nora thoughts to my Saturday Review of Books tomorrow morning. I find books like this one, too, sometimes, but I have more trouble with the ones that my little ones latch on to for some reason that I think are pure drivel. Torture reading! "Bad" is much more acceptable than "dumb." That was a brilliant solution! Yes, we had a birthday this month!